Books We Love will shortly be publishing a new…well almost new…e-book by Lee Killough. Years ago I wrote three science fiction books featuring a pair of detectives…Janna Brill and “Mama” Maxwell. Strange name for him but it popped into my head as I was looking for a name for him and Mama he became and stayed. She’s the tough by the book detective; he’s the unconventional and intuitive partner. 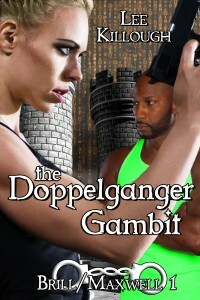 Not very original now but back in the 70’s when I wrote The Doppelganger Gambit it seemed a novel twist. I was re-publishing my old print titles as e-books to give them a second life and reading these three books, the characters and plots still seemed sound. So, I thought…update the tech a bit (because what seemed futurist in the seventies pre PCs and cell phones and tablets was soooo stone age) and we’re good to go. Right. Somewhere I read the statement: What man makes, remakes man. As I worked out the tech, building on what we have right now, and applying that to the story, I discovered how true that statement was. New tech didn’t just affect criminal investigation, it changed the whole society they’re in. So an “update” turned into a two-year job where I ended up writing virtually a new book. Same characters, same crime, same bad guy, and even similar sequence of events, but much different scenery along the way, if you will. I’m hoping readers will enjoy it. But we’ll just have to see.